I don't have a farm. I don't plant seeds, I bury them. So naturally ("nature" + "ally"), I am grateful to all of the farmers in my life. They're my heroes. This year in particular, my appreciation has grown enormously, as I have gotten to be good friends with a handful of farmers, with whom my family have shared many beautiful dinners. These farmers and ranchers have not only supplied me with the meat and vegetables on the table, but they have shown me, through good times and bad, what it means to be a real friend. Pictured above is Love Apple Farm, owned by my friend—more like a sister—Cynthia Sandberg. Tomorrow my family will join hers, and her crew of helpers who've traveled from around the world to work on the farm. I'll get there early to help with the turkey, which we'll cook using local herbs and shiitake mushrooms. My ex-husband and our daughter, as well as his two young sons, will be there, along with my biggest hero, Bob, who's been my partner for over seventeen years. The little grandson we having been raising for four years is out of town, but Logan is truly the center of our gratitude to a beneficent universe for his presence in our lives. 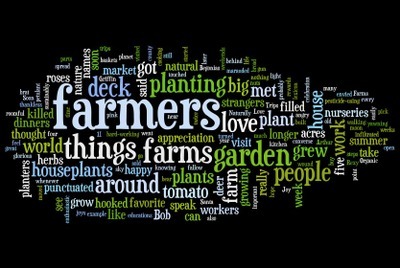 Pictured here: my visit to "Wordle.net" produced this themed art of my own words about loving farms. Go try it out. You can enter a URL for your weblog, or any text you want. I used custom colors and a friendly font. Experimental play is the key. Make your own. And now for something harvested after planting the seed, in a hostile climate, many years ago. It gives me hope for my (or your) relatives who think everything we do is crazy, expensive, or "too California." Some time back, we shared a holiday meal with Some Family Members. While these people are good and funny and fun, they are essentially afraid of real food. My offering one Thanksgiving of an organic turkey with an herb crust and shiitake mushroom stuffing was greeted with skepticism: the turkey skin was discarded (to the dogs) from some plates, and few would even try the suspicious gravy or stuffing with the shiitakes. 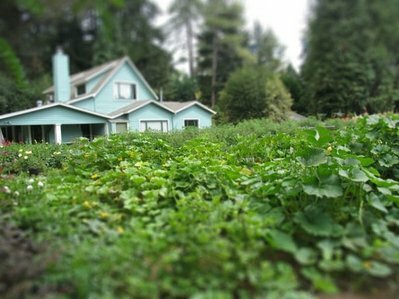 A call for help from outgoing president of the Board of Directors for the Friends of the UCSC Farm & Garden, Jeffrey Caspary, come to my in-box last week. He needed people on Wednesday to help cook for the class of student apprentices that had arrived in late April at the farm. So I thought, "That can't be a bad way to spend part of my birthday." I had promised a 2:00-6:00 shift, but when I checked in yesterday at 11:00 in the morning, I found that I was needed sooner than later. So I loaded up my Indian spices, my new mortar and pestle*, and several ingredients of promise, into the car, and arrived at the farm at noon. "Many hands, light work." Is that a Shaker or a Quaker saying? I don't know, but it's one of my favorites, and Jeffrey himself said it as we started to shell some of the seventeen thousand pounds of fava beans he ambitiously had blanched. He then busied himself with other tasks as Edna, also on the board, tried to master the art of shelling favas. She admitted defeat early on, saying, "Never has a vegetable gotten the best of me so quickly," which left me to shell them for the next two hours, until my neck and shoulders could take no more. * Both Jeffrey and Edna wanted to order one after working with this wonderful kitchen tool. 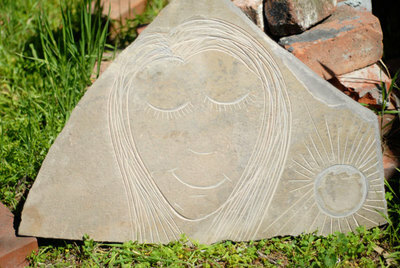 Pictured here: a stone that my friend and client, Ben Bording, spontaneously carved yesterday. He called it "Tana in the Sunshine," and surprised me with it when I visited his family. (He's a landscaper, and I'd link to his site, but it's under development and in transition.) This sweet gesture is kind of the theme of the week: people have said and done and offered the kindest things lately. Yes, it really has been two months since I wrote here. This week must have been some kind of watershed, because I got a bunch of e-mails from people who miss me, asking if my absence was because of "fabulousness" or "otherwise." I hope everyone is enjoying family and friends and not too much stress and/or over-consumption. We made a few dozen gingerbread cookies today—cardamom instead of cloves, and frosted with Grand Marnier. Grown-up gingerbread. There is nothing like having a toddler in the house at Christmas time. Logan's mother and her sister were here to decorate the tree last week, and by the time morning rolled around, Logan had forgotten about it. I heard him run into the living room and crow at the top of his lungs, "POPPY! WE HAVE A CWISSMAS TWEE! IT'S A BIG, BEU-FULL CWISSMAS TWEEEEE!" I'm sure you know that Menu for Hope III raised nearly $60K for the United Nations World Food Programme—my offer of the French Laundry Cookbook netted a nice number of bids (or whatever you call the requests for a raffle prize), and I'm grateful for all of that. Our West Coast leader, Sam Breach, absolutely outdid herself with her above-and-beyond-the-call-of-duty posts. In the Awards department, the map I created for Chefs and Restaurants won the "Best Activist Map" over at the way-cool Platial site. (Thanks, gang—for all the great things you've done with your company, and for supporting what I do.) I really like Platial—any other map geeks out there? Happy holidays to all of you. Thank you for the companionship. Well, not if the owners of this house in Santa Cruz have anything to say about it. (It's over by the Boardwalk, overlooking the San Lorenzo River. Pictured here: brilliant red zinnias at Thomas Family Farm booth. It occurred to me to re-introduce myself for anyone who hasn't been able to cobble together who I am or some of the circumstances surrounding me. If you see mention of “Logan” on this blog, and wonder who I am talking about, Logan is the two-year-old son of my older stepdaughter. When he was just a few months old, he began to spend time here—overnight visits that increased in frequency so that when he was barely over a year old, he lived here most of the time. The conditions under which that took place are a cliché in modern America: grandparents raising children whose parents cannot. For all the reasons you don't want to hear. The short story is that I am Logan's Nana. I spend more time with him than anyone else on earth, and even though we have no immediate genetics, one of the ongoing delights of my life is that people constantly think I am his mother and say we look alike. Our eyes are a lot alike: the only two green-eyed people in our entire extended family. And who wouldn't want to look like family to this sweet boy? Well, this has nothing whatsoever to do with farms, but I am crowing from the rooftop right now. My amazing daughter, whose face I've blurred out at left, is the recipient of a Regents Scholarship to the University of California. This is their most prestigious award, and goes to only 1% of accepted freshman applicants. It is both merit and need based, and covers every conceivable expense for four years: books, tuition, room and board, transportation, everything. She's been offered a full ride at dozens of colleges around the United States, but doesn't want to leave coastal California. As she told her paternal grandmother, who wanted her to go to Baylor "to learn that everyone doesn't think the way California does! ": "I've been to Texas, and if that's the way the rest of the country thinks, I'm glad to live here. I like my nice liberal values, thank you very much."